A total 188 athletes have been flagged off to Burundi for the 1st edition of East Africa Community Games. They will take the form of all East Africa Games and include multiple sports disciplines: Athletics, Football, Netball, Volleyball, Lawn Tennis, Rugby 7s, Karate and Boxing to be competed among the four states – Burundi, Kenya, Uganda and Tanzania. However, of the above eight disciplines, Uganda will not take part in Karate. 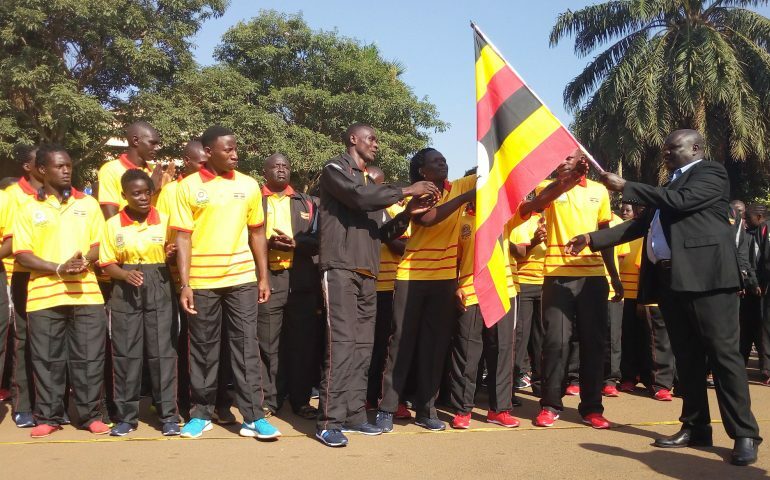 John Bosco Onyik, the National Council of Sports (NCS) Chairman who flagged off the team on Wednesday morning at NCS offices at Lugogo, called upon the participants to raise the Uganda flag high. “This is the first of its kind, so everything you do will be on record, everything you do will go down in history, and I want u to be part of that history,said Onyik. The traveling contingent is made up of 170 individuals in total, with 118 players (64 men, 54 women). Uganda’s U20 National team will compete in the Men’s football while the Crested Cranes will represent the country in the Women edition. Bernard Ogwel the NCS’ general secretary will head the delegation.